After our first round of prototyping, our team discovered that many services were already in place to aid students in their transition from middle school to high school. CollegeTrack, the YMCA, and many of the Sequoia Union high schools acknowledge the challenges of going from 8th to 9th grade and offer services to aid students from East Palo Alto. That we discovered this quite early gave us an opportunity to revisit our initial point of view and focus on a new user group. We realized that the key insight we had uncovered—namely, that the transition from middle school to high school to high school is particularly challenging for EPA residents—applied to parents as much as children. EPA parents clearly had strong parental communities when their children were young. These communities were built around their children’s schools and sports leagues; but just as the move to ninth grade fragmented students social groups, so too did it break apart parental networks. Many parents we spoke to confessed that they did not know the parents of their children’s high school friends. Others lamented the loss of their old parent associations, or grew frustrated at the difficulty of commuting to and from such distant schools. Adopting the asset orientation of the design project, we tried to view this period of transition as an opportunity rather than a stumbling block—an opportunity to build new networks and norms for parents. Once we had defined a point of view statement for parents, we asked ourselves the following question: “How might we generate lasting connections among parents of the same high school cohort?” This question motivated a productive brainstorming session, in which we tried to identify a set of shared interests or activities that might bring parents together. Resource constraints: Parents don’t have the resources (materials, time, etc.) to make such a parental association effective. Motivational constraints: Parents don’t see value in a network of other parents, or parents don’t see themselves as able to lead or organize such efforts. Given our conversation with parents in EPA, we were relatively confident that parents had an interest in getting to know one another. We did still have a number of questions about what parents already knew about their peers, what resources they would need, and who would be willing to lead such associations. These questions led us down two paths: (1) prototypes in the field, and (2) “expert” interviews with parent education liaisons at local high schools. In speaking with school officials at both Menlo-Atherton and Carlmont High Schools, we learned that parental involvement among EPAers is certainly a challenge for administrators, and one that has the potential to improve student outcomes around attendance and extracurricular success. We also learned that parents face certain barriers to becoming involved: distance to the schools, the need for translation services, or financial resources (dues for parent-teacher associations, e.g.). These conversations gave us increasing confidence that the creation of a parental association for EPA parents would benefit parents and students alike. We then embarked on two prototyping missions: The first was a flyer campaign in which we sought to gauge parental interest in high school parents associations, and the second involved in-depth interviews with parents about their interest in one of four possible parent association groups. From these interviews, we came away with two key insights: (1) parents are motivated to work with others if there is a concrete benefit or resource (after school space, transportation, etc.) for their children, and (2) it takes a special type to lead/organize such associations. Though these interviews and prototypes could only give us a baseline level of confidence, they did provide the groundwork for our final proposal: the Shared Collectives Campaign—a service that brings parents together to collectively manage a resource. Such a program would not only give parents and students access to much needed goods, but the collective ownership would generate trust and community among parents. This seed idea formed the core of last week’s presentation to City Manager Magda Gonzalez and her executive team. After hearing about the design process and the proposed solution, our partners seemed enthusiastic about the proposal—not just about the pressing need in this area, but also regarding the feasibility of such a program. Concerns were of course raised about the costs of such a program, how best to partner with the school district, and the identification of key community leaders. But all seemed on board with the notion that parental associations of this sort could not only benefit students and parents, but could serve as a new way for the city to interface with its residents. As we reflect back on the design process, we are incredibly thankful for the opportunity to get to know our neighboring city, and to hopefully contribute to its betterment. Through our empathy work and prototyping, we tried to push beyond our preconceptions and to understand the residents of the city, to uncover their needs, their desires, and their aspirations. By incorporating their feedback and suggestions into the final solution proposal, we hope that we have uncovered something of genuine use to the city. This entry was posted in Define, Prototype / Test on June 4, 2013 by rebootinggov. 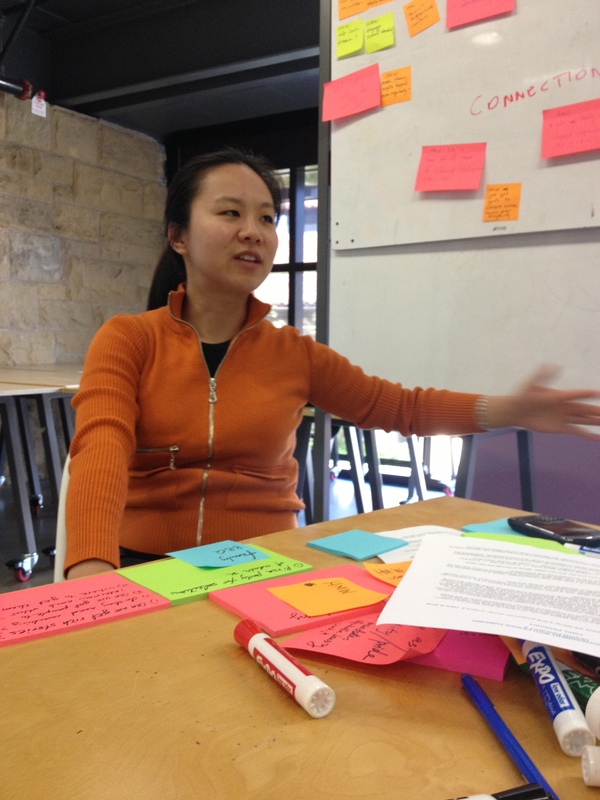 This past week was the most instructive yet for me when it comes to learning about design thinking. It taught me that prototyping can be an alternative form of empathy work, which can generate surprising new information that very quickly leads one back to the drawing board to rethink the problem. 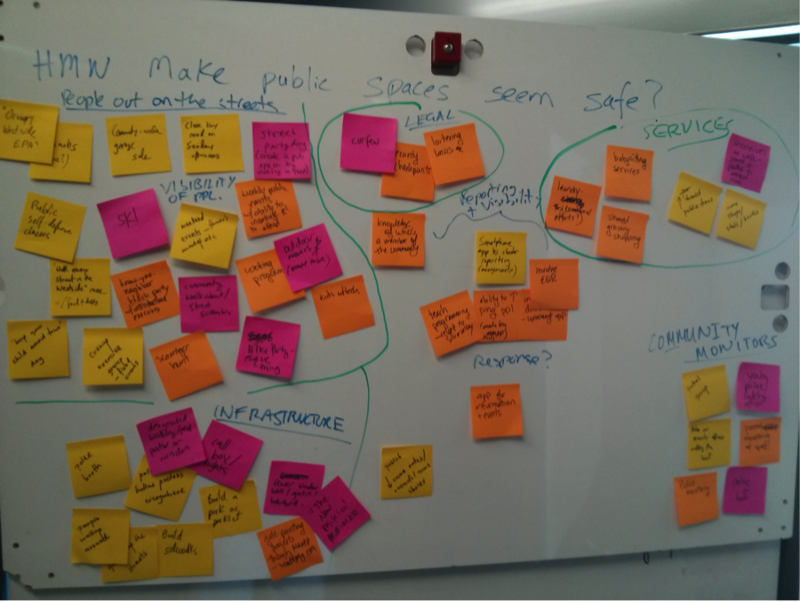 In the previous week, our team grappled with two sets of issues stemming from two our empathy work with two social services providers in East Palo Alto. One is a musician working with youth and the other is a lawyer running a legal aid agency. 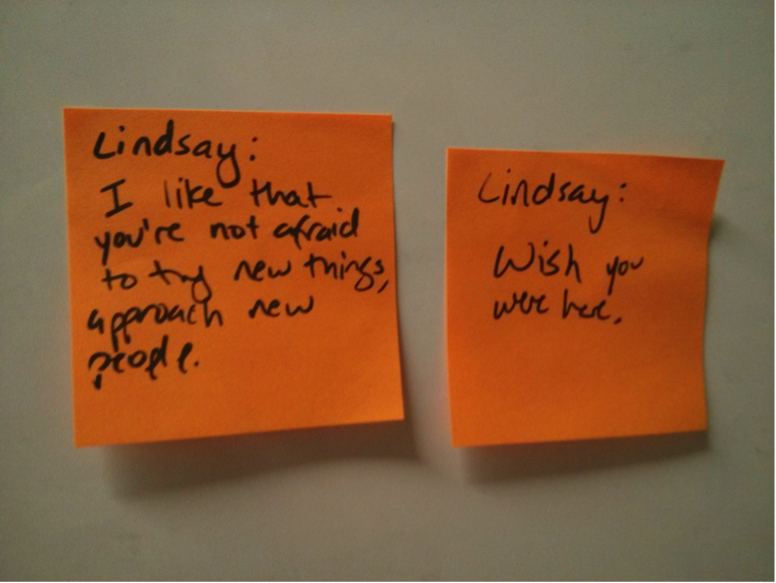 We used these two individuals to develop our Points of View, which provided a focus for our need-finding analysis. Our initial focus was on the lawyer’s point of view, which suggested a need for low-income residents who live in rent-controlled apartments on the west side of EPA to have a greater voice in shaping the general plan for the west side. We recognized that many of these residents are service laborers who help support nearby businesses and institutions. They depend on the low-cost housing available in EPA, a condition that is fairly unique in the area and explains why many of them choose to live there. This insight led to an idea to create a platform through which residents of different backgrounds would interview each other, and record each other’s stories. Those stories would, in turn, be used – via a blog or videos – to raise the profiles of workers who labor in Silicon Valley as support and service personnel. 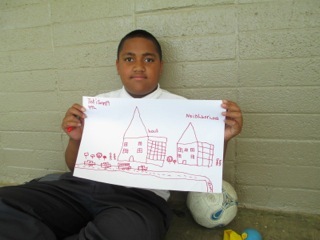 We believed that by telling the stories to each other, some of the cultural differences might be bridged, and that by showing their stories to others in government and business, residents would have a stronger voice as government and business made redevelopment decisions that affected their ability to stay in their low-cost homes. With the mission of gathering stories, I checked out a video camera from the d.school and hopped on Bus 281 to head toward EPA. Even though it was the fourth time I went to EPA since the project began, I actually walked around on foot for the first time instead riding in a car. Somehow the lack of predefined destination helped me pay closer attention to what people were doing and identify opportunities to talk to them. Just by going up to people who were walking their dogs, I got to chat with them and heard some pretty interesting perspectives (about their perception of the root causes of youth violence in EPA, which could be another blog post in itself!). Later, I walked past a Woodland Apartment complex and saw a young man standing on his balcony. He seemed friendly enough, so I went up and told him I was working on affordable housing issues in the area and wanted to talk to residents about their experience. He seemed immediately interested when I mentioned “rent-control” and that residents could get free legal advice on housing issues like threats of eviction. His younger brother and one of their neighbors happened to come home then and joined the conversation with great interest as well. They said that their families frequently receive warnings from the apartment management about missing rent payment even though they had always paid their rent on time. They feel they are targeted because they are Mexican immigrants and that the management wants to force them out. 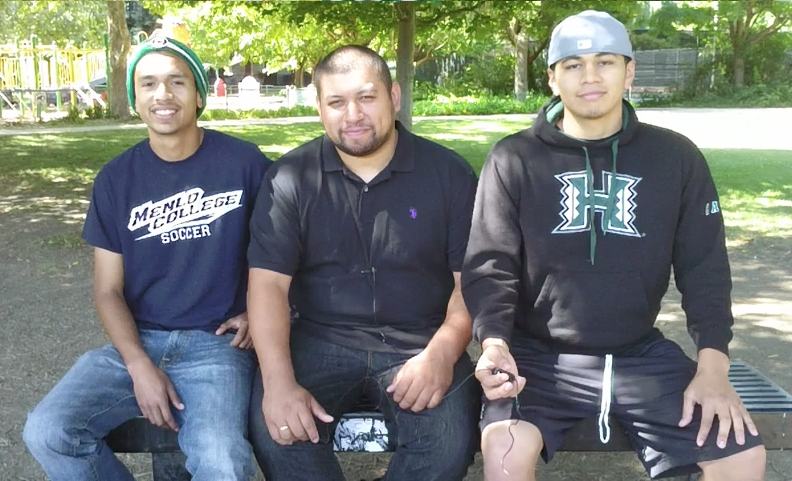 After chatting for a while, the three young men (Rigo, Anival and Christian) kindly agreed to do a sit-down interview and picked the location to be in a park nearby in Menlo Park (which took 20 minutes to walk to). To my surprise, they appeared very natural and articulate when I put a camera in front of them and prompted them to tell me their stories. They told me about how their families moved from Mexico, where they grew up and moved around, and how and why they chose to live in the Woodland apartments on the west side of EPA. It was fascinating to hear that living on the west side was not just about affordability although that’s certainly a big factor. They talked repeatedly about “culture” and “environment,” saying the west side feels much safer and the access to the resources in neighboring cities, including libraries in Palo Alto, Menlo-Atherton High School, parks in Menlo Park, is an important “relief”. Anival, who went to middle school in Cesar Chavez and high school in Menlo-Atherton, said that the ability to see “both sides” meant being able to make better decisions for his life. He is now a student in a community college working toward a four-year college education. The new information and insights from this storytelling prototype prompted our team to rethink the problem as they gave us a much deeper understanding about the people for whom we hoped to design. We rewrote our POVs to focus on the residents’ needs and did a second round of how-might-we’s, ideation and prototyping. It was not easy to go back to the drawing board after a lot of initial hard work, but I felt being iterative and adjusting nimbly to new information got us much closer to tangible problems as well as solutions that could make a difference. 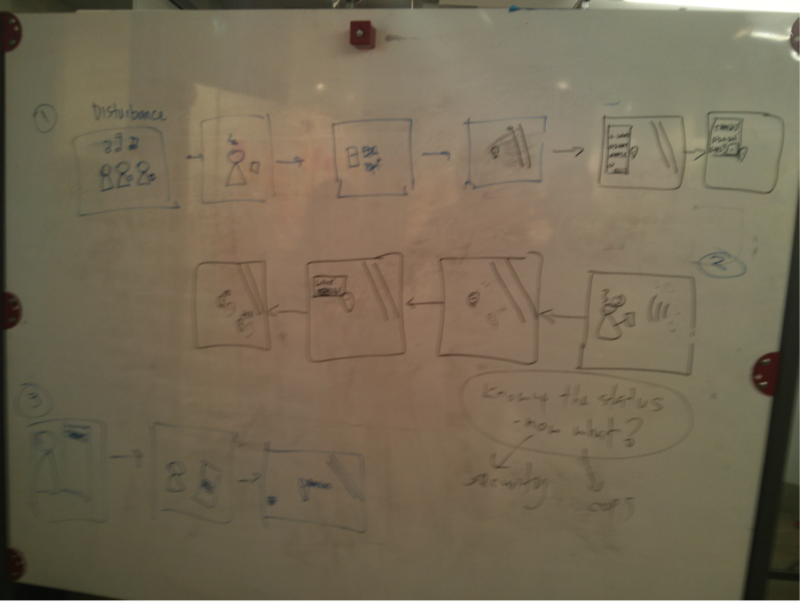 This entry was posted in Empathy, Prototype / Test on May 29, 2013 by rebootinggov. 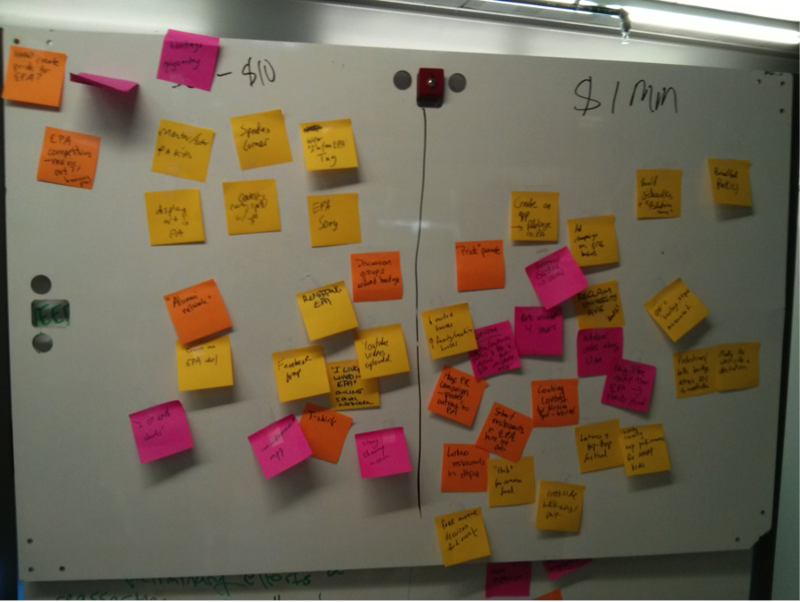 Last Wednesday we got lost in the ideation process. Just the day before we received a lot of feedback on our raw point of views. Perhaps I should say – “too much feedback”. The quantity, variety and depth of comments we received indicated we have a lot of work ahead of us. 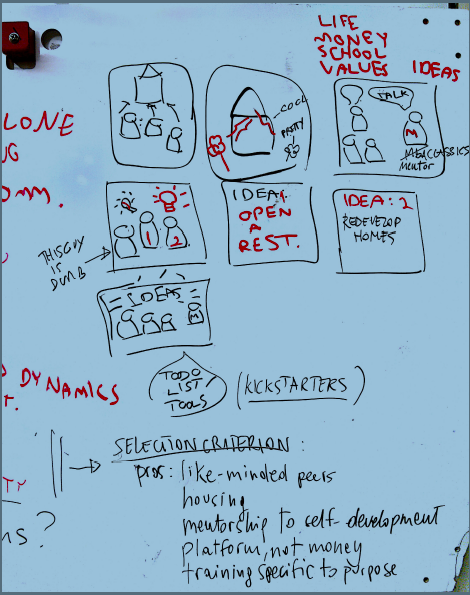 I felt like we’re banging our heads against the d.school’s whiteboards. As frustration started bubbling up, I resorted to my set of “reverse engineering” solutions, and tried to “hack” the design process. At first I suggested we’ll leave our POV for a moment, think of a big, crazy idea, and then trace our way back to a matching POV that would help us make sense, and then restart the process with a fresh POV. Luckily, this little trick did not work. We also tried to think of “How Might We’s” based on the same reverse logic, but when the basics are unclear – every possible direction we tried appeared to increase our frustration. Then we decided to RESTART the process, in the very beginning. We shifted to an insightful philosophical discussion around social justice and market dynamics. Although I was educated with solid social values, I decided to play devil’s advocate for a while. Armed with the Business School hat, I started arguing that with all the sympathy to EPA people, the process of gentrification and eventually gradual disappearing of this community is inevitable as the market dynamics are stronger. Aparna and Federica clearly did not agree with me, let alone I did not agree with myself, but we have come to an interesting understanding that if this community wants to be saved it must, first and foremost, be self-sustaining, self-sufficient and generate local “assets” or “talents” to face the economic tides of the Silicon Valley. We also realized that the great majority of the community actually does not have a choice. Unlike some fortunate members who own an asset they bought cheaply 20 years ago, and can now choose to cash-out and rebuild their lives elsewhere, most residents do not have any intellectual or physical property that would allow them the choice of any sort of social mobilization, other than a very sloppy downward slope. This insight led us to argue that this lack of choice on one hand, and the brutal market dynamics on the other hand, would require the community to be responsible for its fate. Armed and pumped with energies after this discussion, we went back to our interview with Heather, a director at AbleWorks and a member of EPA for the last 25 years. Repeating the highlights of this empathy work and unpacking again specific parts of the interview led us to understand the central problem of the NGO community and EPA in general – they are all in a lose-lose situation. Success is being measured (and perceived) by managing to leave the community, and almost any other case is considered as a failure. In this climate, the city cannot actually develop its local assets to allow growth of financial and social capital for the benefit of the entire EPA community. This entry was posted in Define, Ideation on May 21, 2013 by rebootinggov.